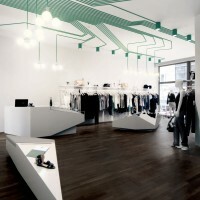 Berlin-based architects KINZO have completed the interior design of the MAYGREEN fashion boutique in Hamburg, Germany. KINZO applied their crystalline signature style, inspired by stealth bombers and 80’s science-fiction movies, to fashion retail: Instead of hiding the cables of the light installation behind a drywall ceiling, KINZO displays them openly to create a “computer chip” pattern that lures the visitor into the centre of the store. The ceiling-mounted lamps were also designed by KINZO and specially manufactured for this project by idee.design.licht., a German specialist in bespoke lighting solutions. The image of a grasshopper, solely composed of green light, adorns the back wall of the store. Selected fashion items are presented on top of low, polygonal platforms that seem to float on the dark oak floor like icebergs. To create the grasshopper KINZO specially commissioned software to convert the greyscale of a picture into a pattern of holes, that were laser-cut into a metal sheet. The grasshopper’s delicate legs and antennae are echoed by the open cabling and green light installation. 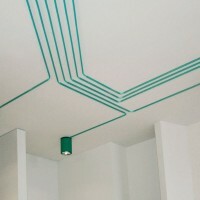 “We covered all cables with green nylon mesh and fixed them on the ceiling to resemble the graphic pattern of a circuit board or computer chip”, says Karim El-Ishmawi. “Instead of hiding the cables we used them as an eye-catching design element. 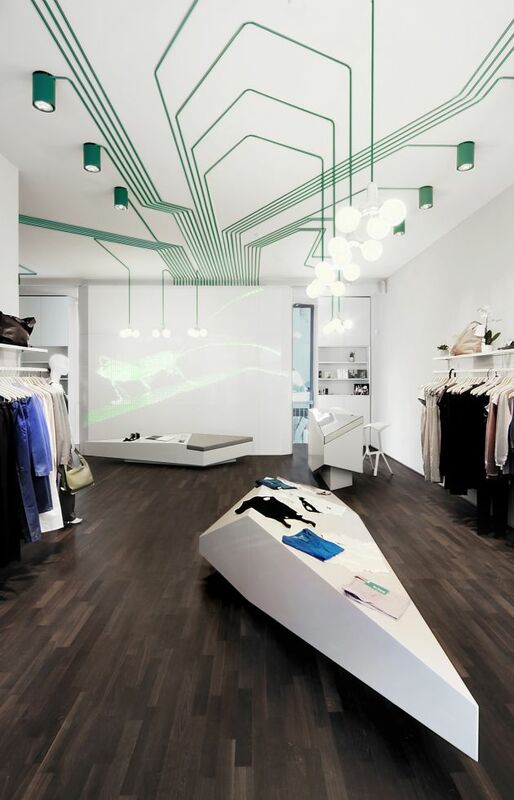 This effect is enhanced by the shop’s otherwise muted colour scheme.” Every single cable ends at a pendant or mounted light, some of which were individually designed and manufactured for MAYGREEN. Visit the KINZO website – here.